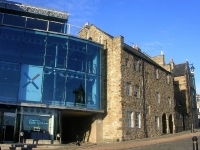 Situated on historic Shiprow, with spectacular views of the busy harbour, the Aberdeen Maritime Museum proudly exhibits the city's strong maritime history and its close connection to the sea. It is an award-winning museum and is housed partly in Provost Ross's House, built in 1593, which justifies a visit all by itself for lovers of architecture. The city's significance in the North Sea oil industry is explored, as well as the importance of fishing, shipbuilding and sailing in the development of the area. Displays are aimed at allowing visitors the chance to investigate the working environment and duties of workers on offshore oil platforms, and include collections of photographs and plans from major Aberdeen shipbuilders, and various naval paintings. Some interactive exhibits ensure that the museum is modern and that children should be entertained by the content, making it a good stop for families. A pirate mascot called Granite Jack guides kids through the museum and there are quiz sheets designed for specific age groups for younger visitors to fill out as they explore. There is also a café and gift shop at the museum for souvenirs and refreshments.